Comments: The Beal Building, located at 380-398 Valley Street, was built circa 1841-1850 on Lot 148. In 1850, Joseph Beal purchased the east half of this lot on which this large brick building with a slate roof stands. 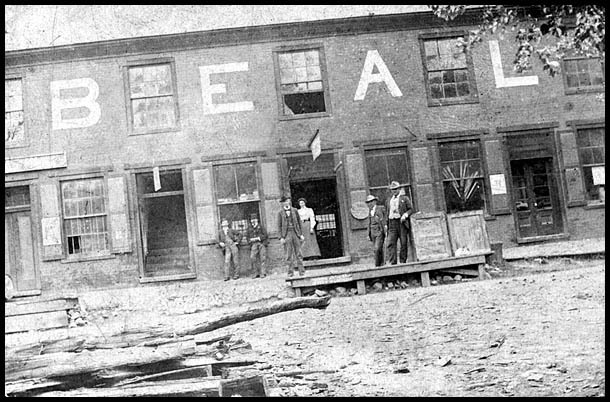 Mr. Beal began his mercantile business in this building, and many Beal businesses were housed here over the following century, giving the building its name. 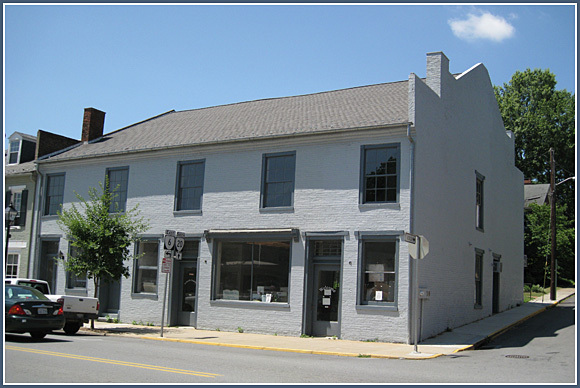 Over its history, the Beal Building's top floor housed the Scottsville Masonic Lodge #45 (1851-1880), the law offices of Thomas Staples Martin in the 1870's and 1880's, and the offices of Scottsville's Justice of the Peace in the early 1950's. The photo below shows the Beal Building circa 1900 with Joseph Beal's two sons, William (Billy) and Jackson, standing on the platform in front of the Beal Building (Billy in dark hat at photo left, and Jackson in hat and leaning on the wooden crate at photo right).